Easy to Install DIY Kits: All of our do it yourself patio covers come in kits specifically designed and packaged to make it easy for anybody to install. 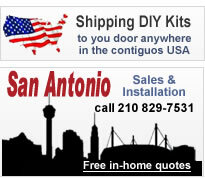 From the normal home owner to a seasoned contractor many of these kits can be installed within a couple of days. You can call before, during, or after you purchase your patio cover kit. Our Expert Patio Cover Installers can answer your installation questions over the phone. Patio covers convert you patio or deck into a protected outdoor living area sheltering you from rain, heat and snow making your patio area a comfortable place to relax with family and friends. Plus a patio cover can reduce cooling cost by shading a wall of your home from the sun in the heat of the summer. W-Pan Patio Cover Kits are our lowest price option in adding a maintenance free, solid roof cover to your outdoor patio area. These do it yourself cover kits feature a gutter on all 4 sides, clear-span of the panels up to 11'1” (while still maintaining a 20 lb live load), easy assemble and an attractive look that will add value to your home. Flat Pan Patio Cover Kits have a flat “ceiling” look and are popular with people who want a more “finished” look to the underside of the cover than the W-pan covers have. Flat pan covers are also recommended for people who are thinking about installing a screen room under the patio cover in the future. The Flat panels have a maximum span of 10' 10” with a 20# live load (.040 pans) and also come with a fascia gutter system on all 4 sides. 3” Insulated Patio Cover Kits provide protection from the hot sun and lowers the temperature by twenty degrees underneath the cover. Insulated covers are ideal for patios, entry covers, glass enclosures and screen rooms. While being more expensive that a flat or W-pan patio cover, Instulated patio covers offer the greatest benefits in energy savings and offer a longer clear-span than the other covers. 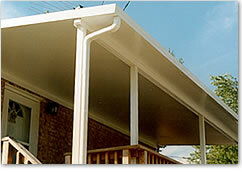 We offer high quality, long lasting, maintenece free aluminum, or insulated aluminum patio covers. Choose from one of our standard size aluminum patio cover kits or we will custom fabricate a cover to suit your needs. Our staff has over 60 years combined experience in designing and installing patio covers and are here to help from planning through construction.